One hundred years ago, on 1 January 1916, the Chemist and Druggist trade magazine presented the annual opportunity for manufacturers, wholesalers and importers to woo their retail pharmacist customers with new year greetings. Browse through the New Year’s issue and you’ll be surprised at how much you can learn about war-time Britain from the advertisements. 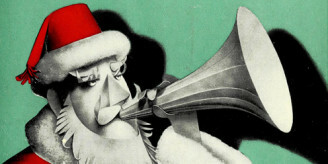 As always with historical adverts, the design work itself is worth close scrutiny. In this edition, there are gorgeous Art Nouveau scrolled borders and ampersands, Arts and Crafts styled imagery, and the standard ploy of featuring animals and children, sometimes in the same advert. 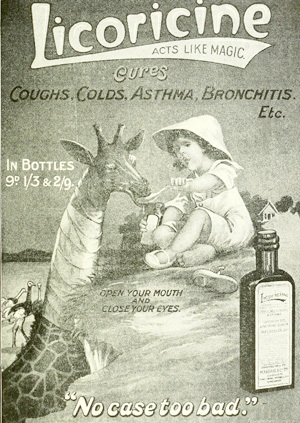 Advert for Licoricine cold medicine from the Chemist and Druggist 1 January 1916, issue 1875. But 1916 wasn’t any old year. It was clear that World War I, now raging for more than 18 months, was not about to end soon. The challenge was to get the tone in these new year adverts correct. Advert for Valkasa “nerve food” on the front cover of the Chemist and Druggist 1 January 1916, issue 1875. 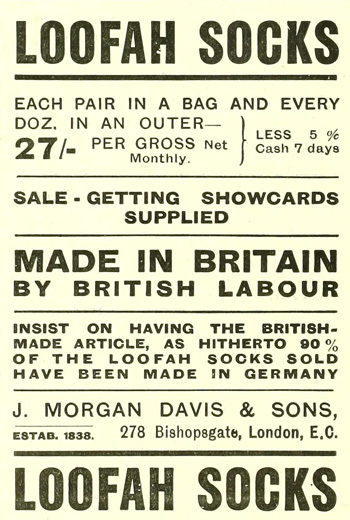 Products from Loofah Socks (“hitherto 90% of the loofah socks sold have been made in Germany”) to air cushions (for sufferers of haemorrhoids) made their British origins very clear. Advert for loofah socks from the Chemist and Druggist 1 January 1916, issue 1875. 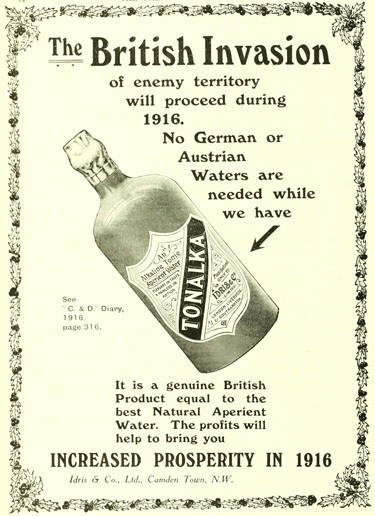 Advert for Tonalka aperient water from the Chemist and Druggist 1 January 1916, issue 1875. Military-themed imagery featured strongly. Sanaphos, “the ideal reconstructive nerve food”, showed a smiling injured serviceman receiving his medicine from a beaming nurse. 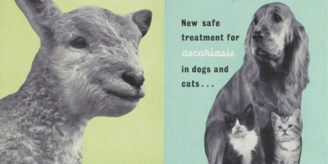 Sanaphos was advertised in other publications as an effective alternative to the German “brain tonic” Sanatogen. 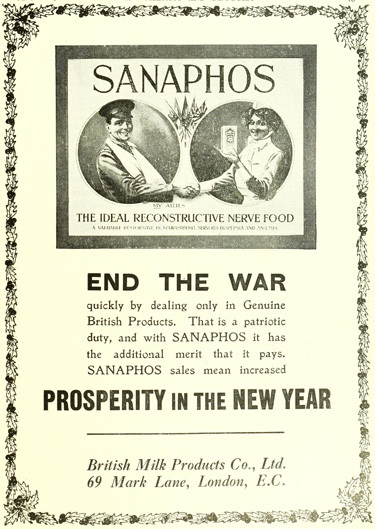 Advert for Sanaphos “nerve food” from the Chemist and Druggist 1 January 1916, issue 1875. Two neighbouring adverts promote alternatives to the German disinfectant, Lysol, first established in 1889. Jeyes’ Disinfectants, with its patriotic nurse, claims that its Jeysol is “identical in composition with original German LYSOL, and equally efficient.” Directly underneath is an advert for British made and owned Lysol, manufactured in Stratford East. But overseas companies were still offering to import products and raw materials. 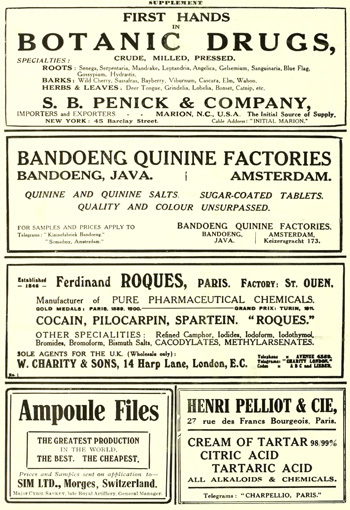 Just one page advertises botanic drugs from North Carolina, quinine from Java via Amsterdam, “Pure Pharmaceutical Chemicals” including cocain [sic], pilocarpin and partein from Paris, and ampoule files from Switzerland. Page from the Chemist and Druggist 1 January 1916, issue 1875. The Northern College of Pharmacy used the staffing shortages as a promotional tool, claiming that they were best placed to successfully train the additional pharmacists needed. 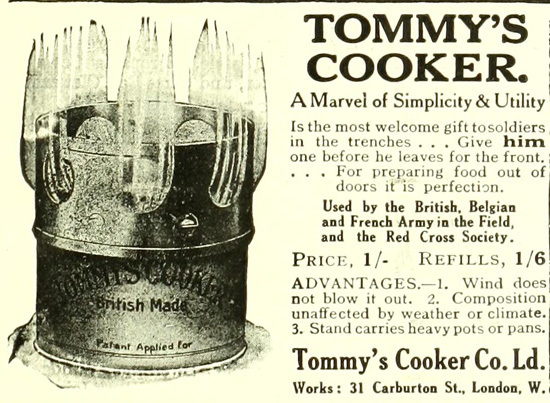 Advert for a portable stove in the Chemist and Druggist 1 January 1916, issue 1875. Note: a significant number of pharmacy adverts refer to P.A.T.A., the Proprietary Articles Trade Association, formed in 1896 to campaign for controlled prices for pharmacy products. There is more on P.A.T.A. In the introduction from Popular Medicines: an illustrated history, published by the Pharmaceutical Press. Briony Hudson is a pharmacy historian and Immediate Past President of the British Society for the History of Pharmacy.